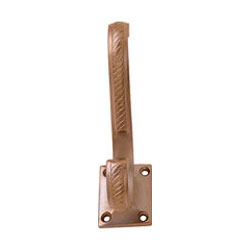 Being leaders in the market, we are manufacturing and exporting an excellent range of Brass Hooks. Our provided range is designed by adept personnel to ensure to design this range in strict adherence to set industry standards. The offered range is available in different design and specifications, as per emerging demands of our clients. Apart from this our clients can avail these products from us at market leading prices. We at "BST Exports" feel pleased to introduce ourselves as industry leaders who have been in trade since two decades. We are one of the largest manufacturing & exporting company for cabinet knobs, door knobs which come in different designs and finishes, cabinet fittings, curtain fittings, door & window fittings, bathroom fittings, machine parts and marine hardware. BST Export has taken upmost care of acting as a good corporate citizen vise a vise complying with local laws and regulations and maintaining business ethics. BST export has chased its growth path with the help of a professionally groomed and dedicated team. Innovations, Quality, creativity, waste cutting and service with a smile have driven us towards our esteemed customers across the globe. Today we stand as one of the top bench mark companies which have never diluted their standards. Our product range made from Brass, Aluminum, Iron, Zinc and SS includes curtain fittings, cabinet fittings, window fittings, door fittings, bathroom fittings, railing fittings, cast & ironmongery, mortise locks and malleable iron etc. We use high quality of materials for our products which are machined then it is given mirror shine polish and protective plating. Lacquer, antique, electromagnetic lacquer, copper antique, black antique, bronze, satin finish and chromes finish are some of the finishes we provide. Our products are presently supplied in many European countries like Germany, Spain, and Denmark etc with supplies to UK and USA also. We also develop new product samples for quality approvals of client without any tooling charges. Our quality service and delivery has given us an edge over customer choice.